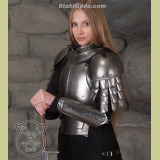 - LARP Steel armor set "Iron Lady" consists of bracers, pauldrons, gorget, cuirass, greaves. 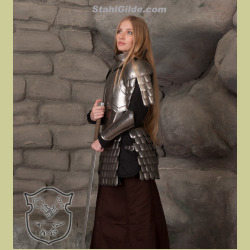 This set is made for women who know their destiny, who value courage and choose the way of battle againts injustice. 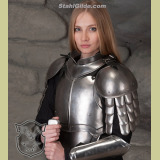 The female armor set is made from steel thicknesses of app.1 mm. 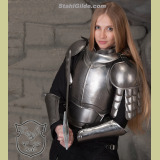 The edges of every elements are accurately rolled by 3-4mm, that is why the details of a set do not have sharp edges and absolutely safe. 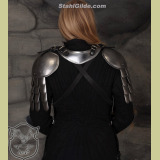 The movable parts of female armor are fastened with high quality leather belts between each other.